Providing manufacturing downtime analysis, the easy way. In Modus7, the logsheet is the set of forms on which raw data is entered. 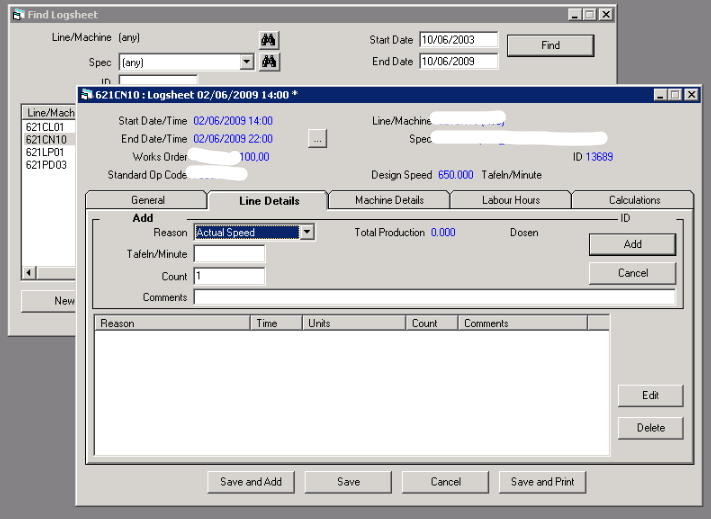 There is a logsheet for each period of data entry, usually a shift, and each production line (or work centre). In a factory with 10 lines working 3 shifts each day there will usually be 30 logsheets generated each day. Each logsheet is specific to the line (or work centre), the product being made and the speed at which it is made, sometimes referred to as the Standard. Speeds are measured in parts per minute or, in the case of moulding, cycles and cavities. A single logsheet will have only one product and one speed, or standard. In the event of a change of product and speed during a shift, a new logsheet is started at the changeover. Actual production, downtime, speed changes, scrap, faults and labour hours are entered on the various logsheet pages. The final page contains a summary of the calculations for the period of the logsheet.